【Event Details】Login the game on the specified date will get the reward. 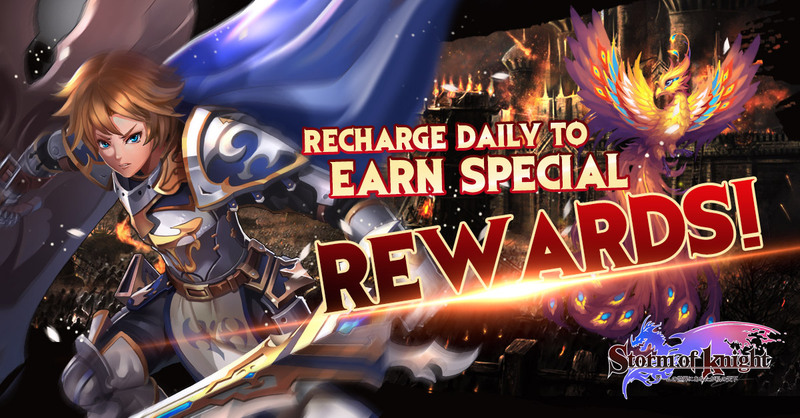 【Event Details】During the event period, recharge any amount every day continuously will get rewards. 【Event Details】During the event period, daily first recharge the specific amount on continuously 5 days will get all rewards. *Not include Free Diamonds, Monthly Card & Growth Fund. 【Event Details】During the event period, single day of diamond recharge will be accumulated. If reach a certain amount will be rewarded with items. Reset at 00.00 everyday. 【Event Details】During the event period, daily recharge repeatedly with any amount will get bonus diamond. Reset at 00:00 everyday. 【Event Details】During event period, every 300 diamond recharge will be entitled to one spinning chance. The diamond recharge amount will reset daily at 00:00. 【Event Details】During the event period, consume to a certain amount to get plenty items for free! Reset at 00.00 everyday. 【Event Details】50% Discount off Black Market & Profiteer's Refresh cost. 【Event Details】During the event period, every spent 1diamond=1point, the point owned can be used for item exchange. 【Event Details】During the event period, Double rewards for Expeditions. 【Event Details】During the event period, Treasure Hunter rewards are doubled! 【Event Details】During the event period, Double reward for Normal and Elite Instance items. 【Event Details】During the event period, Double reward for Trial Instance.